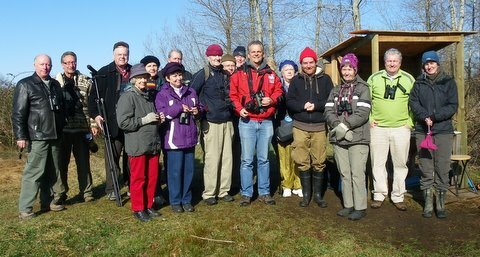 About sixteen birders, including Eleanor’s guests Al and Hazel from Deep River, Ontario, enjoyed a gorgeous Monday morning at Iona Regional Park and Sewage Lagoons. Participants’ names not mentioned, because I forget who was with us, except Lorna who brought me a peanut butter sandwich. Hi-lites of the outing, other than the sandwich, included a Common Snipe, Canvasback and a few Tree Swallows, joyous sights of Spring’s arrival. Check out photos of the outing on our Picasa site at http://picasaweb.google.com/dncbirding. On the drive in to Iona beside the airport, we stopped to photograph the posing dark Harlan’s Red-tailed Hawk with the huge Tag on its right wing. There has been a lot written about this bird on BCVANBIRDS site, but I still don’t know who put, or why there is such a large tag on its wing. At the beginning of the Bay, we stopped to check out the large flock of Green-winged Teal, looking for a Eurasian (Common) Teal. We saw what looked like an American X Eurasian Hybrid with a white bar on its breast and a white stripe on its scapulars. Several flocks of Dunlin gave some neat fly-pasts. At the Iona Parking lot by the washrooms, we cased the pond in front. The sun was bright and unfortunately facing us. Among the flock of Lesser Scaup, a Canvasback gave us a brilliant silhouette. A few Common Mergansers and an entertaining pair of Hooded Mergansers (mating ritual?) were there as well. We started our walk and the Red-winged Blackbirds and Spotted Towhees were singing everywhere. In the first pond were several Gadwall, American Coots, Northern Shovelers and, among the Lesser Scaup, were at least one Ring-necked Duck. A Common Snipe startled us as it flew up in front of us. 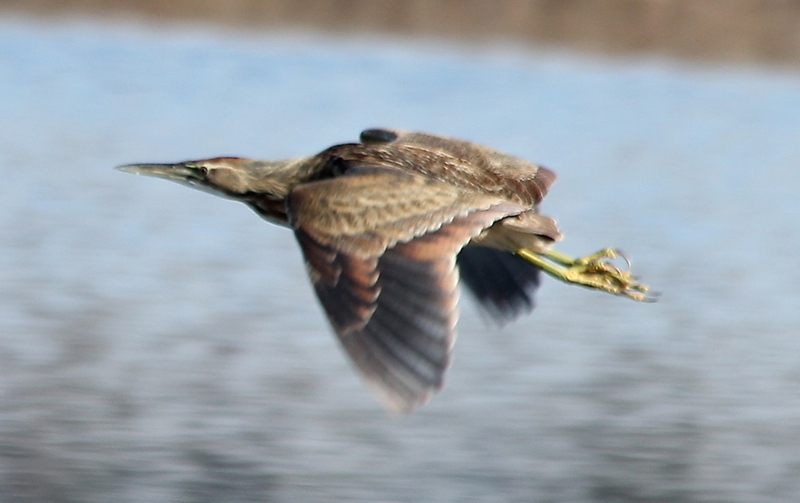 We followed its flight until it landed on the other side of the pond, but couldn’t get good looks at it in the reeds. A few Tree Swallows flew overhead, which made Anne happy as her Bird of the Day. Later on we saw one resting on top of one of the nesting boxes along the river. An American Bittern was roused by some of our group who got good looks at (and photos of) it. There were 13 Mist Nests set up in the Park and we met Mike Boyd and his colleagues who were banding there this morning. He was banding a Fox and Song Sparrow and then gave us a brief talk on bird banding and what his Iona Island Bird Observatory group is doing. 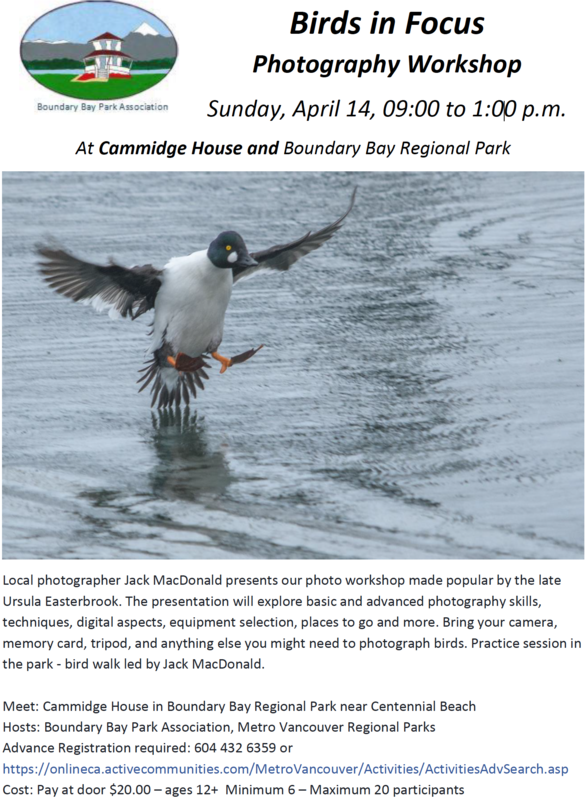 Check out his interesting site at: http://ionaislandbirdobservatory.blogspot.com/. Some sightings he saw this morning, which we missed, included: a Lincoln’s Sparrow, Violet-green Swallows, Virginia Rail, Ruby and Golden-crowned Kinglets and Killdeer. Rick took our obligatory Group Photo with Mike. We entered the back gate of the Sewage Lagoons where a large flock of Northern Pintail were resting on the banks. In the northern pond were more of the same waterfowl we had seen, plus Mallards and Gulls, but fairly close for good viewing. We pointed out Mew Gulls to our Ontario visitors. A few Bufflehead were in another pond and the occasional Marsh Wren was trilling. We left the lagoons to walk along the river. About a dozen Trumpeter Swans and a small flock (30) of Snow Geese were foraging on the other side, while a Bald Eagle stood guard on a pylon. Pelagic Cormorants were feeding “backwards” in the river. Among a flock of American Wigeon, Roger picked out a brilliant drake Eurasian Wigeon. We walked further along the path in search of the Western Meadowlarks and Northern Shrike, but were blanked. Fortunately, Milva, a birder who we met earlier and directed to where the Meadowlarks normally are, got some beautiful photos which she showed us. Timing is everything. 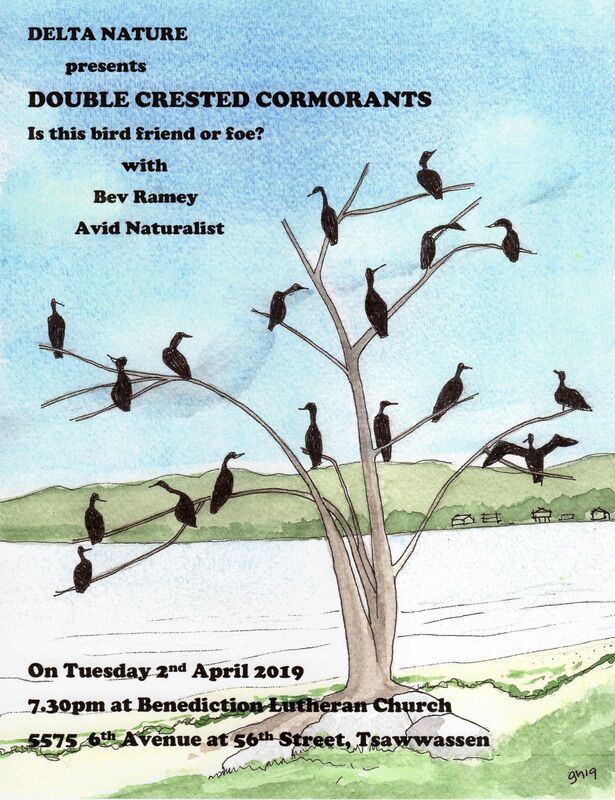 Although we didn’t see some of the birds we were hoping for, we all left Iona about Noon, happy and pleased with a fun morning of almost-interesting conversation in a glorious setting on a beautiful morning. Next Monday, March 14, I will be at Petra’s around 7:30 a.m. for departure at 8:00 a.m. (note earlier time) on an outing to the environs of White Rock. 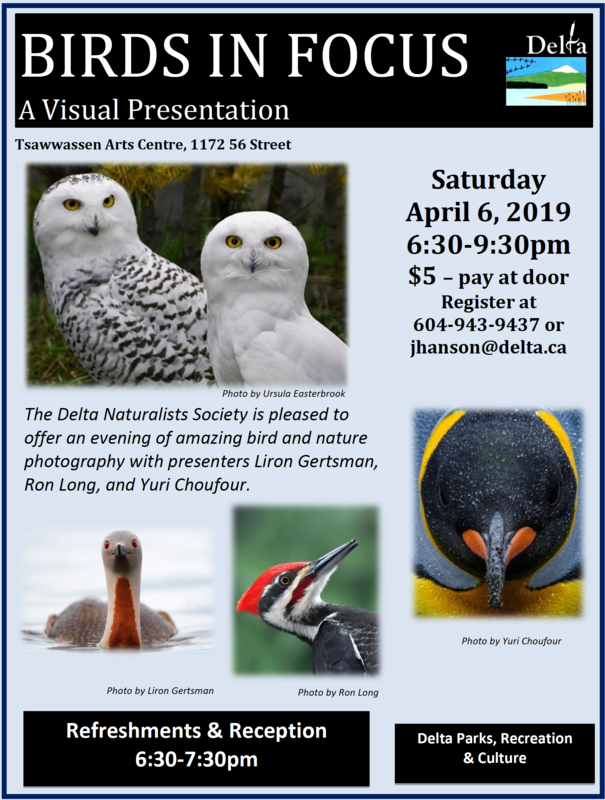 For those meeting us in the area, we will park near the Railway Museum I suspect around 8:30 a.m. On Friday, March 11, I plan to join the Langley Field Naturalists and Al Grass on an outing at Serpentine Fen (WMA), beginning at 9:00 a.m. Also, don’t forget our Delta Nats monthly meeting next Monday, March 14 at 7:30 p.m. at Cammidge House. Conservationalist Abby Schwartz will give an illustrated talk on Beavers and Blackbirds. Sorry about the length of this Report, but I have been away in Ontario for three weeks and I am excited to be back in Lotus Land, and I got a little itchy-fingered. Check out our Blog for other Reports and photos at: http://www.dncb.wordpress.com. Comments welcome, and if you want off my list, please let me know, again. This entry was posted in *DNCB, Iona. Bookmark the permalink.